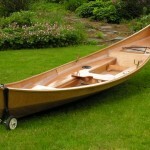 This plywood/epoxy Norwegian Gunning Dory is drawn with inspiration from the classic lines of Scandinavian watercraft. The ply/epoxy hull is much simplified from traditional plank-on-frame versions. 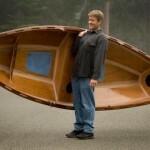 The lightweight version can weigh less than 60 lb (27 kg), making it an easy car-topper. Instead of the traditional V bottom, there is a flat panel on the hull bottom to simplify construction and provide extra stability. Watertight fore and aft compartments provide additional hull support, dry storage and the safety of flotation spaces. Additional compartments are optional and open-water versions can be built self-bailing. Loaded with gear for camp-cruising or with a passenger and gear, the boat becomes increasingly stable for general recreation, fishing, or drifting small streams and exploring waterways. The 15′ 9″ (4.8 m) length and 45″ (1.14. m) beam provide a stable platform. 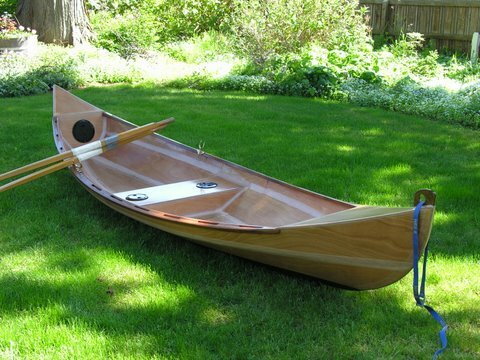 The Norwegian Gunning Dory can also be poled, or paddled like a canoe. There is room for two fixed-seat rowing stations or a single sliding seat; the lightweight hull is fast enough to make open water rowing with a sliding seat interesting. Maintenance is much reduced with epoxy sealed plywood and the slick, hard graphite covered bottom allows dragging the hull over parking lots, launch ramps and gravel beaches. The 30-page building plans are $46 and include photos, sketches, step-by-step directions and a discussion of many options to help the amateur builder customize the boat to suit usage. See additional photos with 2 interior layouts and details at www.butlerprojects.com.